Eye-tracking is the process of measuring eye movements. A typical goal for eye-tracking research is to determine where subjects’ gaze is focused on. Some eye-trackers, in addition to monitoring gaze, can do some other measures including pupil size or blink rate. Scientists are interested in eye-tracking because of what is called the “Eye-Mind Assumption”, based on the idea that we focus our processing resources on what we are looking at. By monitoring eye-movements, researchers try to deduce what is happening in the brain. Intentions, goals, expectations, memories, beliefs, and personality: these factors influence where we choose to look. It is therefore of interest for many researchers to explore these processes. To explore the relationship between gaze and brain activity, researchers choose to realize simultaneous measures of fNIRS and eye-tracking. fNIRS and eye-tracking are two complementary techniques: while scientists measure subject’s neuroactivation with fNIRS, eye-tracking monitors engagement of the subject and his task-compliance. Eye tracking also allows the control of the stimulus, increasing the range of operations that can be investigated. fNIRS presents a huge advantage in comparison to some other neuroimaging modalities, including fMRI: its temporal resolution. fNIRS having a high temporal resolution, it is possible to establish precise correlations between gaze and neuroactivation. Integration with eye-tracking systems is easily achievable. Here below we show an example of the integrated setup NIRx NIRSport and SR Research EyeLink 1000, via standard TTL signaling, typically via a parallel port on the display PC (although the parallel port of the EyeLink host PC can also be used). The only other component required is a trigger cable, supplied by NIRx. During task performance, the stimulus presentation software sends simultaneous TTLs signals to the NIRx equipment and messages to the EyeLink Host PC, marking key trial events, allowing data to be co-registered at the analysis stage. If your stimulus PC does not have a parallel port, commands can be sent over the ethernet connection to the Host PC, so its parallel part can be used instead. As shown below, the eye-tracker does not interfere with the fNIRS signal. It is possible to detect an emerging Parkinson’s disease with eye-tracking. Using this method, scientists can track eye movements of the subject. Eye movements typically follow distinct patterns. In case of Parkinson’s disease, these patterns can be altered because of loss of cells that use dopamine to coordinate movements. These changes, that can be unnoticeable to a casual observer, could be detected thanks to a sensitive eye tracking. fNIRS can also be useful for performing tests to study the effects of Parkinson’s disease in cortical activity. Parkinson’s disease induces dysfunctions in some cortical areas in performing tasks, that can easily be detected with fNIRS. The combination of these two methods can furnish relevant results to detect and follow the evolution of Parkinson’s disease. Autism Spectrum Disorders affect 0,7% of the population. Early detection significantly improves chances to develop learning and refine communication. It is possible to detect Autism Spectrum Disorders with eye-tracking. During the diffusion of images, eye-tracking allows to notice that subjects with ASD are not focused on the same fixation points than typically developing: they fix on few social images in comparison to regular people. With this method, it becomes possible to detect ASD in the early development of children. fNIRS is a non-invasive, comfortable and non-heavy neuroimaging technology. This is an ideal modality for measures on infants and children, possibly developing ASD. It is possible to detect Autism Spectrum Disorders with fNIRS: indeed, during visual and auditive social stimulations, blood flow in the brain of ASD subjects is different from typically developing: we notice a reduction of blood flow in some cerebral areas like bilateral frontal area, temporal area, limbic system and basal ganglia. 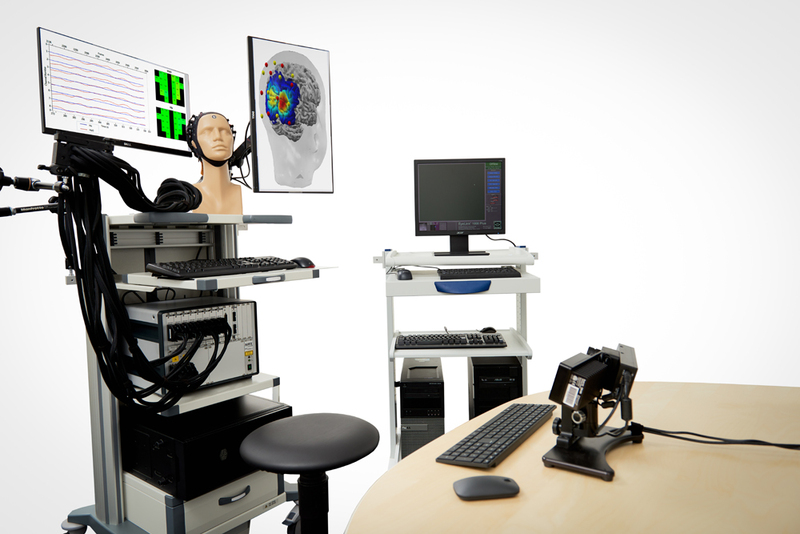 Concurrent fNIRS and eye-tracking are ideal to detect ASD in early stages regarding their ergonomic characteristics and results delivered. It is therefore of interest for scientists to combine these two methods.